When planning the layout of a workshop, it is one thing to move the actual items around the space you have until the layout looks functional, but often the items are bulky and cumbersome, and trying different layouts becomes arduous. In the past, I have found making a scale model a very useful tool (cardboard boxes representing each machine). Another tool that is useful is this one from Grizzly. 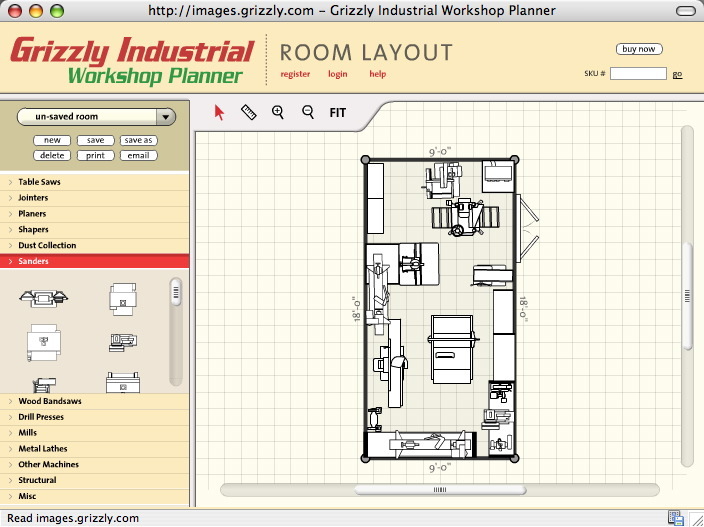 It is an online, free workshop layout tool. It only has available the actual machines that Grizzly sells, but using a little bit of creative licence, and you can very quickly try different layouts to see how it all could come together. Looking at a quick mock-up of my place, and I can see something I forgot that I needed…….. floor space! Working from top to bottom, there are 2 tool chests, a 14″ bandsaw, 15″ thicknesser, and a stereo in the top-right corner. Next is the router table, with the Jet Mini Lathe overlapping, and a drill press beside the door. Then there is the 6″ longbed planer (jointer), the tablesaw and 2 shelf units. Finally, a grinder, a second lathe, and a bench with an SCMS, slow grinder, and sander. Nor do I, but I still find this a very useful tool, and I don’t have any issue with the images either – they could be photographic quality but I’m more interested in position and scale, not a photo-realistic workshop representation. But if it isn’t a useful tool for you there is a simple solution. Don’t use it. i need to find a way to make a 3D model so i know what to do i cant find anywhere on the internet that i can make on so i can show my grandpa to make my shelve and cabinet he dose not understand what to do but i do and he needs something to show him to do it so that he can help with the cutting the wood???????????????????????????? Just a line to let you know that I use the basic old rubber thong cut into sections to clean abrasive belts on my sanders with great effect. i usually get them from second hand clothing shops.